The big news in the publishing world this week is that Barnes & Noble has officially joined the e-book reader battle. The company released nook, a product it hopes will steal some of the market from amazon's Kindle and Sony's Reader line of products. BN is touting two major advantages of the nook over its competition. 1) Part of the display — where you can browse through books — is in color, and 2) You can lend your e-books to other nook users for up to 14 days. That's kind of cool, until you discover that you can't access a book you've lent, just like a physical book. Isn't it a bit odd that they went out of their way to add this restriction? 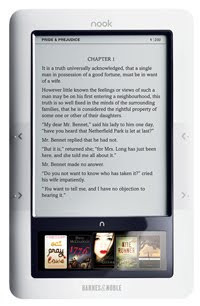 Anyway, nook costs $259 (same price as Kindle), uses a 3G wireless connection and most new release books are available for $9.99. What's your take on the e-book craze? It definitely elicits some strong opinions, mostly along the lines of "I need to have the touch and feel of the physical book in my hands, and I like collecting books for my shelves." Certainly valid points. I'm not fundamentally opposed to the idea of the e-book reader — I don't own one myself, but if I traveled a bit more or had fewer unread books on my shelves, I could definitely see myself enjoying one. Besides, I think anything that gets people to read more is a good thing in my book, and that's exactly what's happening, according to this NY Times piece. I haven't jumped into this craze (yet) but the B&N nook would be the one I'd want to get. I love how the display includes book covers. That's one of my favorite things about a book! The other thing I love about books is the feel and the *ahem* smell, so I doubt e-books will ever take precedence over my precious books. I agree - the nook looks pretty slick! If I ever take the plunge, it'd be the one I get too - though I hear Apple is supposed to release one next year, which will probably be pretty sweet! I am getting a reader for xmas, just not sure if I am going for the kindle or this new one. Thanks for the post. I gave you an award. Thanks for the info. I haven't gotten into the e-books or really want a reader yet. I still like having the book in my hands. I'm sure I'll catch up to the electronic age sometime! I brought a dozen books on our honeymoon and it was a bit too bulky. I love the kindle. I am addicted to cheap sci-fi books. There is a series called second ship. It only cost a dollar and perfect reading on a flight. Dan Drown meets Roswell and Harry Potter. The Special Guest. A movie project is in the pipeline and you can become a part of it too!. Just signup for our Blog and stay tuned for the latest news.